With Facebook currently relying on Sponsored Story posts in-feed to monetize the smartphone platform, eye-tracking researcher EyeTrackShop says the social network needs a better model if it expects to maintain decent average revenue per user on mobile platforms. According to its tests of how people view the Web, iPad and smartphone versions of Facebook, the user has much less opportunity to view a sponsor’s message on the smaller screen. A Sponsored Story on a phone that falls below the fold on a screen has only a 3% to 13% possibility of being seen by a user, the tests show. Even if click-throughs on Sponsored Stories in mobile feeds are the same or much better than their Web-based counterparts, the incidence of them being seen is much lower than on desktop or tablet. “With the current business models Facebook mobile ads will decrease the current ARPU, compared to web ads,” the study states. Part of the problem is that the eye is heavily focused on the first screen of a Facebook feed and at the top post when EyeTrackShop studies user interactions on an iPhone. The reliance on being in the feed puts Sponsored Stories at a considerable disadvantage to their Web ad counterparts, which have a persistent presence in the right column of a Facebook page. On the Web, ads are the second-most viewed item in the eye-gaze analysis. On mobile phones, EyeTrackShop found that among its 400 survey respondents, fewer people saw the sponsor message on their phones than other platforms. They spent less time viewing the ads than on other platforms. And they had “significantly lower ad recall,” the study states. The iPad, on the other hand, indexed higher than even the desktop. The company finds that ads on the iPad are seen by 18% more of the viewers, and the units themselves get 29% more dwell time than Web ads. Ad recall was about the same as on the Web. EyeTrackShop results are not quite in line with some earlier metrics that suggested mobile Sponsored Stories had a much higher click-through rate than their Web cousins. Facebook ad API partners in June published results showing mobile Sponsored Stories received 13 times the clicks as Web Sponsored Stories and had eleven times the eCPM. On the other hand, EyeTrackShop’s research argues that these units are actually viewed less often and for less time. And of course, the desktop version of Facebook is monetized both from Sponsored Stories, which run on mobile, and the standard side rail ads, which do not currently run on smartphones. Regardless of any disagreement over the actual performance of mobile ads in feeds for advertisers, Facebook itself might disagree that the smartphone platform is not monetizing. On last week's conference call with investors over its Q1 earnings, Facebook CEO Mark Zuckerberg claimed that half of the $1 million a day Facebook earns from Sponsored Stories is coming from mobile. The arguments over Facebook’s mobile monetization model are at the heart of its stock volatility and analyst uncertainty over the company’s future growth. Facebook’s otherwise positive financial report last week was mitigated by ongoing worries that revenue growth would slow as more usage of the social network migrated to mobile platforms where there was less overall opportunity to monetize users. 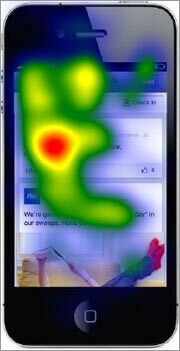 3 comments about "Eye-Tracking Study Claims Facebook Mobile Model Needs A Fix ". Anne Peterson from Idaho Public Televsion, July 30, 2012 at 8:20 p.m. When I check Facebook on my mobile phone, I am doing a scan, a quick check; I don't even look at everything my friends post when that is how I access my account. daniesh alfie from fezzbook, May 31, 2014 at 1:09 a.m.